While I have an appreciation for kimono fashion in general my love lies with pre-WWII, with a focus on The Greater Taisho Period, a time spanning 1910 to 1930. I find this particular period saw massive inovation with not only design and colour, but with kitsuke itself. 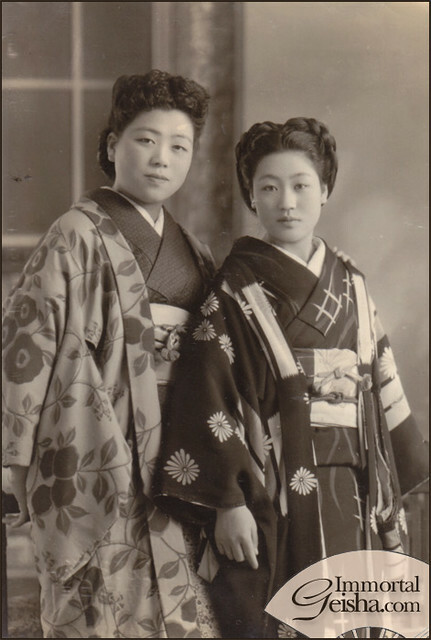 I collect postcards and photographs from this period of time along with other pre-WWII images that may catch my attention, as I love viewing the different ensembles worn by the women and the huge differences of kitsuke between one person and the next. While most of my collection is geiko and maiko from Kyoto, I have also collected a number of pieces which show geisha in non-hikizuri kitsuke, along with regular, everyday women. I’ve decided to devote a section on my blog to these ensembles of yesteryear in the hopes they inspire us today. This photograph came from a photo album of a group of geisha from Akita, spanning many decades – starting out in the early 30’s, with photos up to the mid 60’s. This particular photograph is one of my favourite – no exact date is attached, but it’s likely to be from the late 30’s. The hairstyle on the geisha to the right is nothing short of stunning. While simple in style, the way her braids frame her face, forming a heart feels effortlessly chic. I also love how nicely their collar sits, although it is a rather tell-tale sign they are geisha, as non-geisha would likely have worn the back of their collar closer to the nape of their neck. 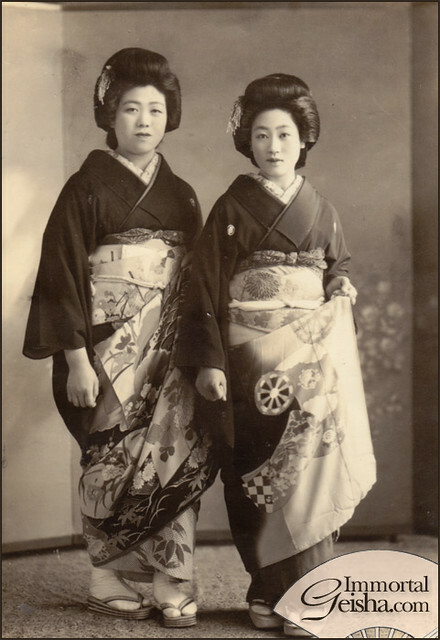 Curious to see how these ladies look in their geisha finery with hikizuri? This photo would have been taken on New Year’s Day – as in addition to wearing kuro hikizuri, they are also wearing rice husk kanzashi. Kimono Challenge #1 - How did you discover and get into kimono?